Let’s say that you’re already working on an existing Angular project, and you wish to add the Ignite UI for Angular library into the project. In this blog post, we will follow a step-by-step approach to add the Ignite UI for Angular library in existing Angular project. 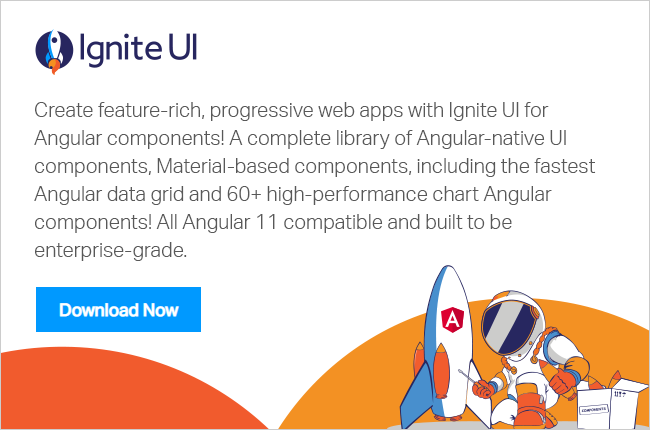 Begin with adding the Ignite UI for Angular library in the project. We can use npm to do this. So, run the command shown below to install Ignite UI for Angular. Next, you need to install Hammerjs, as Ignite UI for Angular uses Hammerjs for gesture. By this step, we have added Ignite UI for Angular in existing Angular project and configured required files. We are going to use Ignite UI for Angular DatePicker component to test whether everything is configured and installed correctly or not. In addition, to work with DatePicker component, you need to add following modules. Now, when you run the application, you should get DatePicker component from Ignite UI for Angular added in the application. You can select a date and that will be displayed. I hope this article will help you in adding Ignite UI for Angular library in existing Angular project.